Avinoam Segal-Elad is not new to the United States. The community’s new director of the Center for Israel Engagement and community shaliach, based at the Jewish Federation of Northern New Jersey, has a cousin in Teaneck and parents who made aliyah from the United States in 1973, after the Yom Kippur War. For the past few years, he and his wife, Havi – the couple have two children with one on the way – have spent the High Holy Days in Westchester, N.Y., where he has served as chazan. Segal-Elad took up his position two weeks ago and will serve for two years. He said he was in “constant contact” with people in the community for the past few months, in order to hit the ground running. 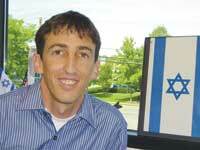 Israel is “rich in Jewish life and beautiful things are happening,” says the community’s new shaliach, Avinoam Segal-Elad. In Israel, he worked as a lawyer, serving in the attorney general’s office in Jerusalem and dealing with public law. He and his wife were looking for a change, however. “We wanted to do something significant and then go back,” he said. Segal-Elad praised the Birthright Israel model, premised on the notion that strengthening one’s connection to Israel strengthens Jewish identity. The shaliach said he worked with a few Birthright trips and saw the effects of that philosophy. He sees the country’s social justice protests – which began in July and drew thousands of young Israelis from a variety of socio-economic and religious backgrounds – as a particularly positive example. In addition to his planned roundtable, he said, the Israel center will continue its Israeli film festival. He also cited the community’s ongoing connection with the city of Nahariya, including interactive projects among schools in both countries.